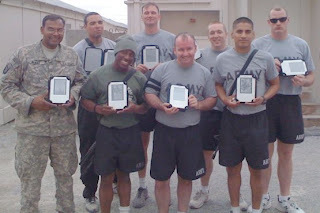 Last year on Memorial Day weekend I wrote about Operation Ebook Drop, which provides free ebooks to soldiers overseas, and a program that I'm proud to be a part of. OEBD has been a great success, and since last year at this time the # of authors involved has quadrupled to over 800!! So this year I started thinking: it's great to provide free ebooks, but what about the e-reader itself? Kindles and similar devices have come down in cost, but they still aren't cheap. This led me to research the subject, and I found that the answer was right under my nose, based in my home state of Connecticut. A non-profit called E-Books for Troops, that started a program called "Kindles for Troops (K4T)". K4T is a terrific program that enables you to donate your pre-owned Kindle reader to a soldier who is deployed overseas. It is ideal for someone who wants to put their existing Kindle 2 to good use as they upgrade to a newer third-generation Kindle Wi-Fi or Kindle 3G, or for someone who wants to directly donate a Kindle 3 reader. As mentioned, it's great for someone who has recently upgraded, or maybe converted to an IPad, leaving an extra Kindle laying around the house. But if purchase a new one to donate, it is also tax deductible. One thing I can guarantee from my dealings with soldiers this past year with OEBD, is that they will be both gracious and thankful. Here are the directions to donate.